Blueberry Scones - Do You Know The Muffin Man? Notes: An early morning project on one of the hottest days of the summer. This is a fussy recipe (like many Cook's Illustrated ones are) that calls for freezing the butter and grating it, and folding the dough similar to doing puff pastry turns. 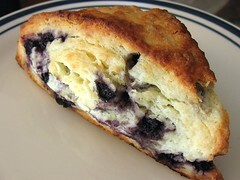 The method ensures that the blueberries are encased inside the scone rather than getting burnt. In the end, the result is worth it. Tender and flaky and moist on the inside, blueberries throughout, and a slight crunch on the outside.